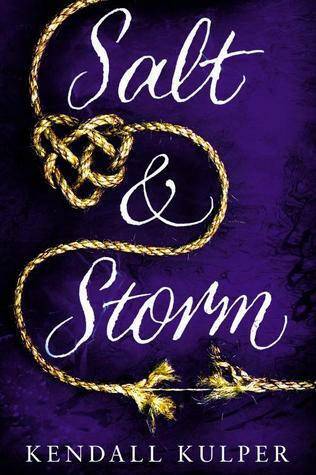 Salt & Storm is riddled with old ideas brought back to life. Yes, a story of witches has been done before. We are the Harry Potter generation, after all. What makes this book unique can be found in the details. Avrey Roe comes from a long line of Roe witches. These women are brave and sacrificial, giving up their lives in order to serve the island that they love so much. Tied to the island, they control the elements of nature, helping mariners and villagers alike. Kendall Kulper's storytelling is so exquisitely beautiful. She able to bring to life the character of Avrey and convey her youthful passion for life, love, and the island itself. At the same time, the reader can feel the ancient familial undertones that guide Avrey's life. Everything about this story is pushed forward by love, even when the choices that are made seem completely opposite. This story is wildly feminist without overdoing it. The women in this story are strong. Men may come and go, as well love and heartbreak. But like a lighthouse on a lonely shore, the Roe women remain constant. The strength of the Roe women goes back generations as Avrey learns of her past. She is a girl born of magic and memories, and she sees that love sometimes requires sacrifice. Placing this story on a lonely whaling island makes the heart of the novel so much sweeter. It adds a poignant touch to the characters. Pain and love, seasides and sacrifice. They all seem to go together so brilliantly--like opposite sides of the same coin. There is just so much about this book that was executed perfectly. Kulper's prose is one that can make your heart ache and soul soar. This tender little novel has definitely made its way my "favorites" shelf. Do yourself a favor and preorder this book now. You won't regret it. It is definitely a good read! I hope you enjoy it! Yay great review! This sounds really good especially because of the strong female characters! It is definitely a great book! I hope you pick it up soon!